I'm watching with great interest AOL bid $900m for Tradedoubler. The update is that TradeDoubler's largest share holder, Alecta, has said the offer is too low. Google News currently has over 100 stories on the bid. At times it must look as if Google dislikes affiliates. The search engine doesn't like "duplicate text". In effect, Google doesn't want to match nine of the top ten search results to affiliate sites who then channel users back to the other site in the top then. The Quality Score system does seem to be most harsh on affiliates in Paid Search too (and affiliates have those tiny margins to work with). Again, I don't think this is anything to do with Google disliking the concept. Google is just trying to reduce the quantity of poor quality sites. When (sorry; if) Google rolls out a cost-per-acquisition model (this is a topic I've not talked to Google about and can therefore safely blog about it - and I must stress that) then that might change. Would you go to a third party when Google could manage your performance based advertising? Well. Maybe! AOL and Alecta certainly seems to think so. After all, right now the only way Google has of inserting content on publisher sites is through AdSense and that's limited. The likes of TradeDoubler offer far more sophisticated content options. There are product feeds to enjoy. There are even search engine fronts to put on your site. Further more, with affiliate marketing it is the publisher - who knows his site best - which is responsible for matching the best banner for his content. The deal has other merits for AOL. AOL bought Advertising.com back in 2004. I've certainly seen Advertising.com appear as a merchant on TradeDoubler in the past. There is interest in tapping into all those page impressions affiliates generate. If AOL owned both companies - and if they worked together - the super affiliates could be converted into media publishers or even visa versa. Then there's the video battle. Ask Google and Advertising.com who has the largest network of video publishers and you'll get a different answer from each. There's a battle to be fought there. It's certainly possible to distribute video through TradeDoubler's network. Video on a cost per acquisition model would be interesting... but video has a further twist; cost per play. The cost per click or cost per impression model is weak because there's no way of telling if the user really did anything. A cost per play model which defines play as "getting to the end" or "watching at least 50%" of the video would be one where the merchant knew for certain that they had audience engagement. Suddenly TradeDoubler's large network of sites is a worthwhile prize. The news is not the best for everyone. 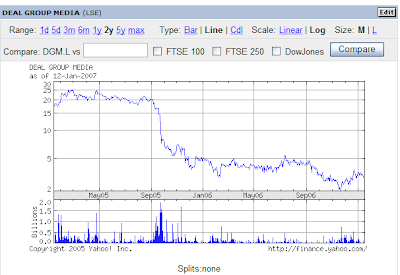 Deal Group Media's shares, which had begun to rise from their all time low of 2p, seem to have begun to drop again. Deal Group Media's DGM Affiliates has a large network of publishers too. Who knows. If AOL is unsuccessful in their attempts to grab TradeDoubler perhaps DGM/Fuel will be in line next? JC, over at AnotherJunction, will likely have some thoughts on this too.